Our Soap Twosomes make great gifts! Soap Twosome Gifts are two bars of handmade soap wrapped in our colorful paper cigar bands, stacked inside a clear cellophane bag, and tied with complementary color raffia. A gold foil label on the back lists the theme of the Twosome, and the soaps included. You choose from eleven different theme combinations, like Goat Milk soaps, Unscented soaps, or Hand Repair soaps, and we go from there to prepare your gift combination. Our Goat Milk Soap Twosome includes two delicious cream soaps for extra lather and moisture. Our Seasonal Soap Twosomes include two full size soap bars wrapped in colorful seasonal fabric inside a Cellophane bag. Our Classic Soap Twosomes include two full size soap bars selected from our tried-and-true Classic Bestsellers. 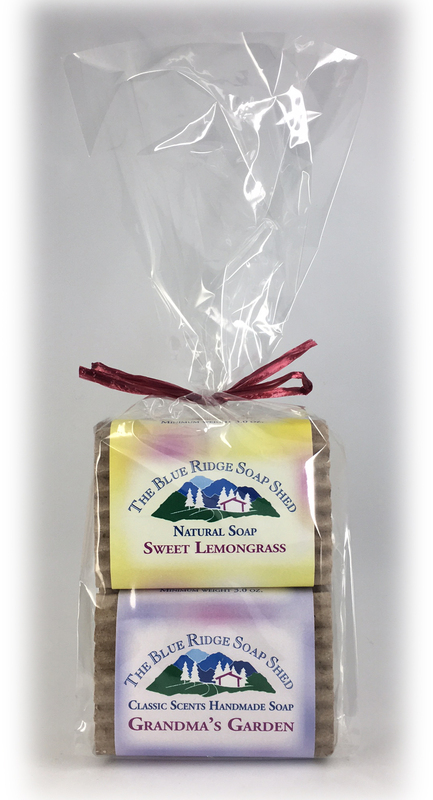 Our Mountain Twosome include two full size soap bars of our regional Mountain scents wrapped in colorful fabric. Order our Manly Soap Twosome, we'll select two different varieties of our terrific Manly Soaps for you. Our Baby Soap Twosome includes two full size soap bars wrapped in adorable baby colored cigar bands. For Valentine's Day gift giving and those with a sweet tooth, choose TWO goat milk soaps from among our mouthwatering creams - better than any box of chocolates! Our Shea Butter Facial Soap Twosome includes two full size soap bars of our luschious facial scents. Our Hand Repair Twosomes include two full size soap bars wrapped in colorful fabric, and placed inside a decorate Cellophane bag. Our Outdoors and Camping Twosome includes two full size soap bars useful for outdoor and nature activities.